The Hunger Games: Mockingjay, Part 1 is already one of the most anticipated movies of the season, but that hasn’t stopped the studio from finding new, creative ways to promote the film. When compared to traditional advertising, branded content creates a more entertaining and interactive experience for fans, and that’s exactly what Lionsgate did with its most recent campaign. Working with YouTube, the studio created a branded online video series that stars seven of the video platform’s stars, each of whom will act as a citizen of one of the film’s fictional “districts.” The five-episode series has seen significant success in the short time it’s been live, amassing more than 1.4 million views in just two weeks. This just goes to show how powerful branded content on YouTube can be. Even if you aren’t looking to create a movie studio-quality series, you should still consider adding custom branding elements to your uploaded videos. InVideo Programming, a trio of YouTube branding features, aims to help you grow subscribers and increase video views across your Channel — here’s how. A distinctive introduction can not only make your videos more memorable, but also help you build a consistent brand that fans will recognize. As you can see in the example from PBS above, Branded Intros are short clips that you can add to the beginning of your videos in order to promote your Channel, series, or tutorials. Upload your three-second intro video as an unlisted video. On your Channel’s InVideo Programming page, click “Add a channel branding intro” and select the video you’d like to use. The last step is important because you can choose to add the intro to all of your videos or just the ones you’ve uploaded after a certain date. Intros can be removed or changed later, so don’t worry if you missed something. That said, if you’re trying to create consistency, avoid changing your intro too often. We should also note that it can take some time for the intro to appear across all of your videos — especially if your catalog is quite large. So if you’re adding an intro for the first time or changing it up, it’ll take time for the new one to appear. The same rule applies if you’re removing intros altogether. 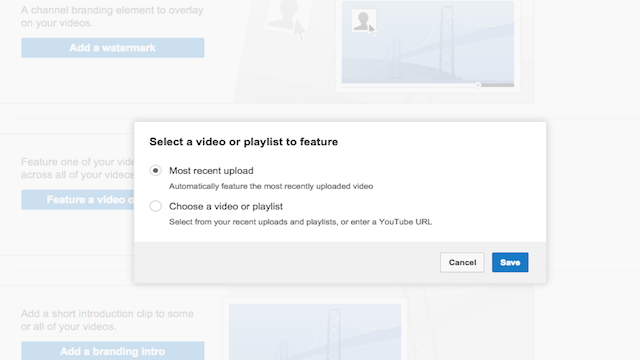 Beyond introductions, you can also feature a video or playlist across your entire YouTube presence. This is a great way to drive additional views or provide viewers with extra resources. As with Branded Intros, the setup process is very simple. Just select “Feature a video” from your Channel’s InVideo Programming page. From here you’ll be able to choose which type of video you want to feature. If you decide to feature a specific video or playlist, you can choose from your own uploads or enter a YouTube video URL — regardless of whether you uploaded it or not. This could be a great opportunity to promote collaborations with brand partners and fans. The video will display consistently across devices in the bottom left corner. On mobile, viewers will see it in portrait view on Android devices and in both portrait and landscape modes on iOS devices. It’ll also include a label with the video information that appears when viewers hover over the video icon. Another simple way to feature your branding across all of your videos is by adding a watermark. This could be your company logo (like Tide’s) or the image you use to represent your brand on social networks. 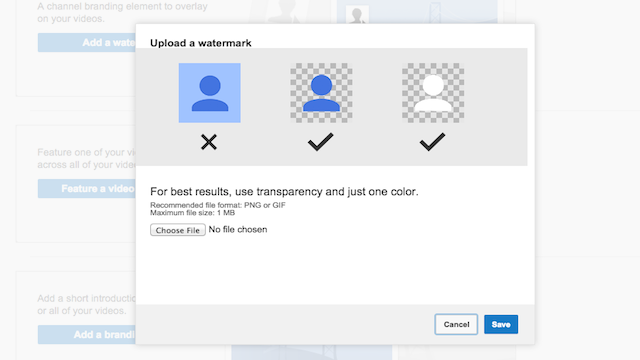 It will be overlaid with opacity on all your uploads, so it’s recommended that you use transparency and just one color in the image you choose. Your uploaded watermark will appear in the upper right corner of all your videos across all devices, and will allow viewers to directly subscribe to your Channel if they hover over it. This is a wise option if your videos earn a lot of shares. That way when new viewers come across it, especially if it’s embedded on a website, they’ll know who to associate the video with and can easily subscribe. Keep in mind that InVideo Programming can’t be used to sell advertising, sponsorships, or promotions. Doing so violates YouTube’s Terms of Service and could result in loss of access to the tool and/or termination of the account. So even if you can’t swing a five-part custom series, there are still viable ways to incorporate your branding across YouTube. And if you’re ready to look beyond branding, we’ve also shared some tools and tactics to help boost your Channel’s discoverability.